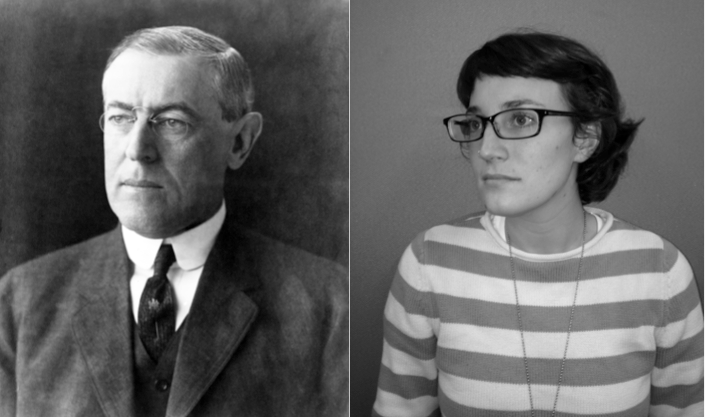 President Woodrow Wilson and his great-great-granddaughter, reporter Wilson Sayre. Press play to hear reporter Wilson Sayre's radio essay. Beside it was a Wilson campaign poster from which he looked through his iconic pince-nez glasses and over his long, angular nose at me. But the person I was named after was, in many ways, a mystery. I have never been very open about my ancestry, not because of Wilson's political or social beliefs — I certainly take no credit for his successes, nor assume his shortcomings — but because of what he represents in my family: a figure of success, guided by strict morals and fervent convictions. Wilson’s policies and ideas were some of the most progressive and wide-sweeping in our history. Of them, his "Fourteen Points," which created the League of Nations, was perhaps his most recognized legacy. It was the seed of the United Nations. 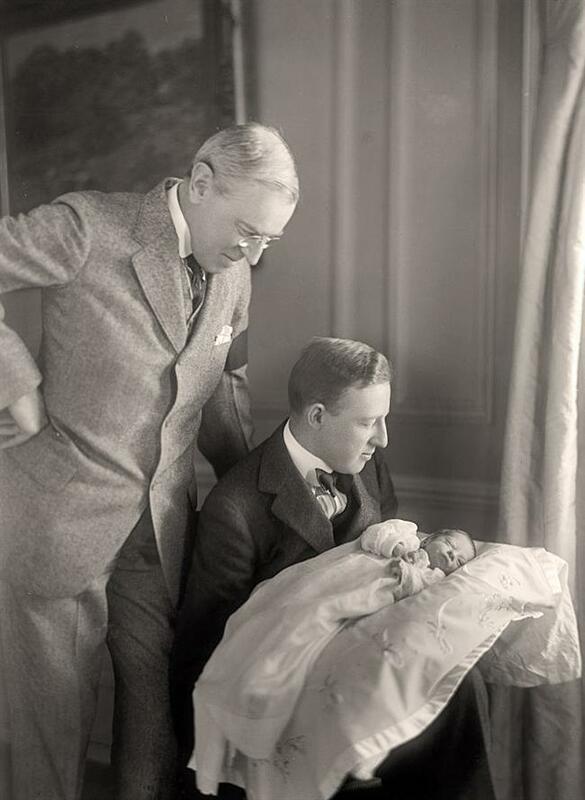 Three generations of Sayre's family: The baby is her grandfather, Francis B. Sayre, the last child ever born in the White House. How do you live up to that? How could I get a handle on Wilson’s face, glaring at me every time I walked upstairs, demanding: "So, what have you done with your life?" When my mom found a trunk full of letters packed by the then-president’s son-in-law, she sent them off to the Woodrow Wilson Presidential Library in Staunton, Va., so they could be properly preserved. I wanted to unpack them -- the stacks of letters and the meaning inside. I spent the summer before my senior year of high school sitting in that tiny Woodrow Wilson Presidential Library in Staunton, Va. On the second floor of the building where Wilson was born more than a century ago, I brushed the dust off envelopes, deciphering what seemed like archaic forms of cursive, and explored the characters between the words. I then read each and every scrawled list, lament and love letter. They were correspondences between Wilson’s daughter and her husband. Woodrow was only tangentially involved in many of those daily goings-on. He turned that into a learning moment by putting me in touch with someone who built his career knowing what was "historically important": A. Scott Berg, the Pulitzer Prize-winning author of "Lindbergh," a biography of the famous pilot. People often ask me to tell them something surprising that I've discovered about Woodrow Wilson. 'Well,' I say, 'you'd probably be shocked to know that Woodrow Wilson wrote some of the most passionate love letters ever written.' So there -- for example -- what most historians might consider the least 'important' of Wilson's archives reveal so much of the man ... who would then proceed to make the 'more important' history. In short, almost everything constitutes ‘valuable historical evidence.’"
Growing up, I lacked that panorama of life for Wilson. Who he was, I came to realize, is so much about when he lived, the family and people he surrounded himself with, and the ease with which he could be brought to tears. 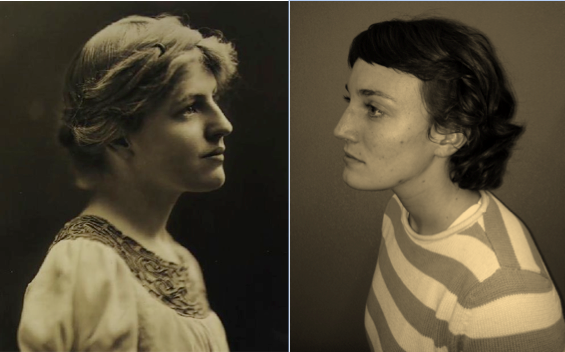 Woodrow Wilson's daughter, Jessie Wilson Sayre, and her great-granddaughter, Wilson Sayre. He came from a line of Protestant ministers. Those Protestant teachings formed a framework on which my great-great-grandfather hung his own brand of moral and ethical code. It was this highly moral, severe Wilson that looked down at me from his campaign poster. Stern, unforgiving and hard to live up to. But his daughter, Jessie, wrote in her letters not about fear of her father, but of his lovingness. “I came down early and had breakfast with Father. It was so nice. He talked about many things and was so affectionate that I am resolving to do it every morning,” she wrote in May of 1914. 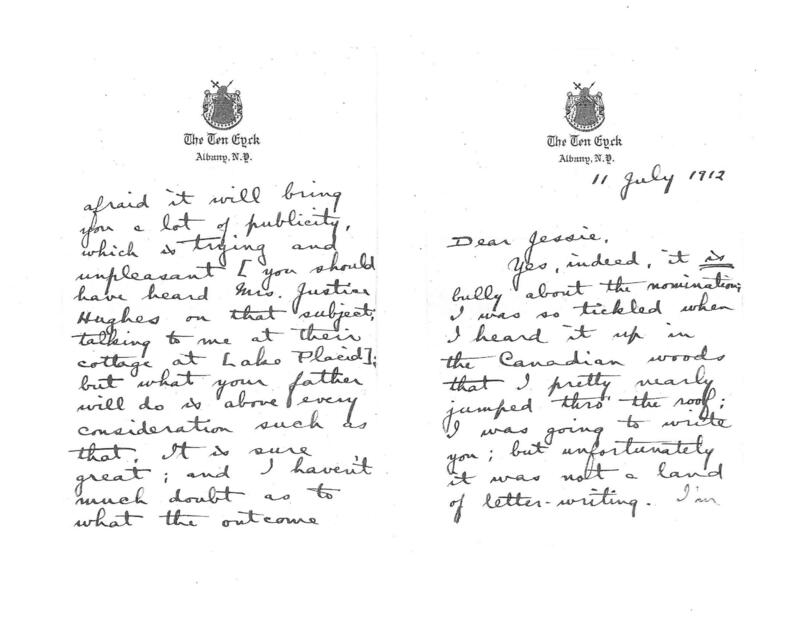 One of Wilson Sayre's family letters, from Woodrow Wilson's time. I read dozens of letters with short lines like this. And slowly, Wilson became family. He had his flaws: He was stubborn and had a bit of a temper, but who doesn’t? After seeing him as a human, I came to notice similarities between him and the family that followed. From history, we learn something about who we are, indeed. By translating letters, seeing artifacts and places, and reading about Wilson (Berg’s biography came out this September), I’ve stopped avoiding the eyes in that campaign poster in my parents’ stairs. The man who looks down at me from that staircase whenever I go home has a story now. The formerly black-and-white Wilson has color on his cheeks. A. Scott Berg will be at the Miami Book Fair International at 1:30 p.m. on Saturday, Nov. 23. The 30th anniversary of the Miami Book Fair International is upon us. In honor of this great event, our tireless staff has gone through the Fairgoer's Guide and each picked out what he or she won't be missing this year. Please share what you'll be looking forward to in the comments. Maybe we'll run into each other at the WLRN booth. The book fair is my Ultra. That’s how I explain to concerned friends my almost-maniacal enthusiasm for our city’s belletristic blowout -- a party currently in full swing, having started Sunday with the inaugural ceremony and talk from cliffhanger superstar Dan Brown. But in its 30th year, Miami Book Fair International's hundreds of thousands of attendees, more than 400 authors, and 200 national and international street-fair exhibitors make it impossible to see everything. There was, perhaps, a notion 30 years ago that any reading done by anyone in Miami mainly consisted of a paperback on a beach, some suntan oil and very little else. But a small group of people felt differently. So when the Miami-Dade County Public Library system wanted to celebrate its newest building, the idea of a book fair was born. "Books By The Bay," it was first called, conceived in 1984 as a few displays of books, tablecloths flapping in the breeze at Bayfront Park. When Sherman Alexie comes to Miami Book Fair International, he enjoys the visuals. Alexie is the author of award-winning novels, poetry and short-story collections about Indian characters living on and off modern-day reservations. His protagonists frequently share a deep, obsessive love of books and basketball. From our prior literary projects, we know South Florida has a lot of aspiring bards. So in celebration of the 30th anniversary of the Miami Book Fair International, we asked you to help us tweet-compose a poem. Richard Blanco -- a Miami-raised poet who wrote the presidential inaugural poem this year -- started us off with the first line: "Why the stars? Well, just look up, look"
We left the rest up to you. Read the result below. All of the conversation about food at Miami Book Fair International inspires the appetite. Unfortunately, if the past is a guide, the food at the Book Fair is not curated with the same care as the authors. It's basically overpriced carnival fare. The Miami Book Fair International, celebrating its 30th Anniversary this year, will not only host a ton of books both new and used, major and underground – there’s also extensive programming that will likely cause bibliophiles to salivate. Throughout the week of the fair, a slew of notable authors (more than 400) will be speaking about their work, and panels will be held on a wide range of literary subjects.